The Program is a leader in Agribusiness Mgt. Education and has been Ranked No. 1 Agribusiness/Food Industry Mgt. Program in the World by Universal, Paris a global ranking and rating agency specializing in higher education. Candidates appearing for the final year bachelor’s degree/equivalent qualification exam and those who have completed degree requirement and are awaiting results can also apply. 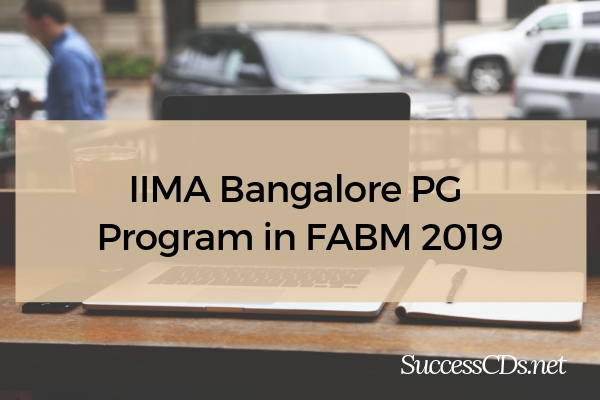 The selection of candidates for admission to the 2019-21 batch of PGP-FABM at IIM Ahmedabad is a two-step process. In the first step, candidates will be short-listed for Group Discussion (GD) and Personal Interviews (PI) from among candidates who have applied for the programme and have a valid CAT/GMAT score and satisfy the eligibility criteria for the programme. For short listing the candidates for PGP-FABM admissions, 70% weight age will be given to the scores of CAT and 30% weight age to the Application Rating Score. Since the programme is sector-specific and prefers candidates with relevant educational background, the candidates with bachelor's or master's degree in agricultural sciences or agriculture-related disciplines will be preferred while short-listing for group discussion and personal interview. Short listing of candidates with bachelor's degree or equivalent qualification in any non-agricultural discipline (candidate’s eligible under section 1.2 of eligibility criteria) will be provisional, subject to their submission of the specified form describing their nature of interest in the programme. This form will be available for submission from the link showing CAT results for the programme. The form will have to be submitted online by the deadline specified on the link showing CAT results for the programme (the deadline would typically be within 7 days of declaration of the short listing results by IIMA), failing which, the candidature of the shortlisted candidate will be cancelled and the candidate will not be considered further for admission to the programme. It would be the sole responsibility of the candidate to track announcement of results by IIMA and ensure compliance with the submission deadline. The Fees and other charges payable by the PGP-FABM students of the 2018-2020 batch for their first academic year is approximately Rs. 10,64,000/-. Laptop computer, personal expenses on boarding, travel, clothes and laundry are extra. The fees and other charges for the 2019-2021 batch will be based on the fees and other charges for the 2018-2020 batch, adjusted for inflation.